Software ninjas in the making. A few years ago, the idea of coding bootcamps—unaccredited programs that teach adults eager to break into the tech industry how to write software—was foreign even in Silicon Valley. Today, though, bootcamps are a normal part of the tech hiring landscape, pumping out thousands of developers each year who compete against new computer-science grads for entry-level software jobs. 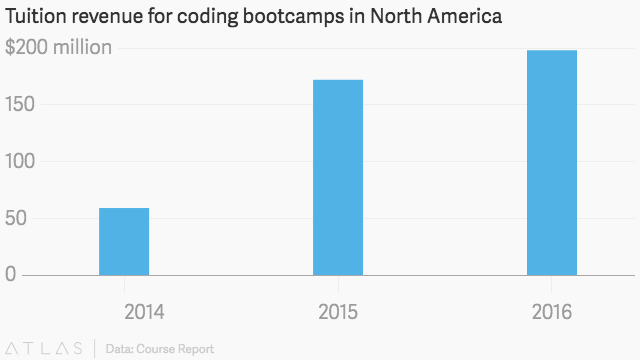 In 2016, an estimated 18,000 students will complete coding bootcamps in the US and Canada—a more than eightfold increase compared to 2013. That figure was released today (June 22) by Course Report, which tracks the coding school industry and offers a single process for people to apply to multiple schools. All together, coding-school students will pay $198 million in tuition this year, up from $172 million in 2015 and $59 million in 2014. 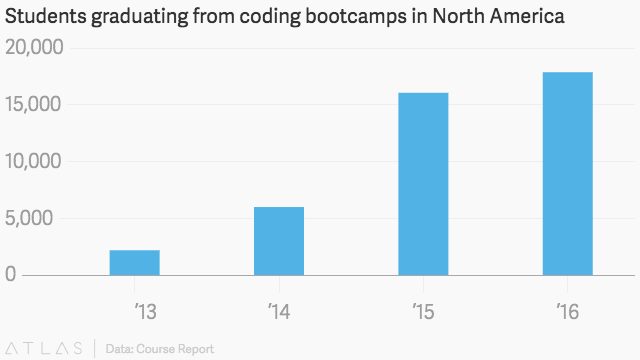 But the total amount of revenue for coding bootcamps is likely much greater. That’s because there are a few different business models in the industry. Some schools charge only for tuition (in 2016, Course Report estimates an average fee of $11,000 for programs that typically last 10 to 12 weeks) while others receive payment from partner companies that employ their grads, similar to how recruiting firms work. A smaller fraction operate by a “deferred tuition” model where students aren’t charged anything upfront but pay a percentage of their salaries (usually between 18% and 22.5%) for one to three years after graduation. In their early days, coding schools in the US concentrated in cities with established tech scenes, such as San Francisco, New York, and Chicago, and it wasn’t unheard of for people to move halfway across the country to attend such programs. But Liz Eggleston, cofounder of the Course Report, says she’s noticing more schools setting up shop in smaller markets, such as Milwaukee, Wisconsin and Gainesville, Florida. “Now it’s not necessarily an education option for people who can move to a huge tech hub,” she says. So do these bootcamps do any good? The report released today focuses just on the size of the market. But a Course Report survey from October found that grads on average boosted their salaries by 38%, or $18,000, after completing their programs. …and though the bootcamps are whiter, on the whole, than computer-science programs, they do have more African Americans and Native Americans, two minorities that are severely under-represented in tech.